Study and Enjoy our environment. We educate the entire World. We receive people from all over the world. The School's main building alongside Changanyikeni road. 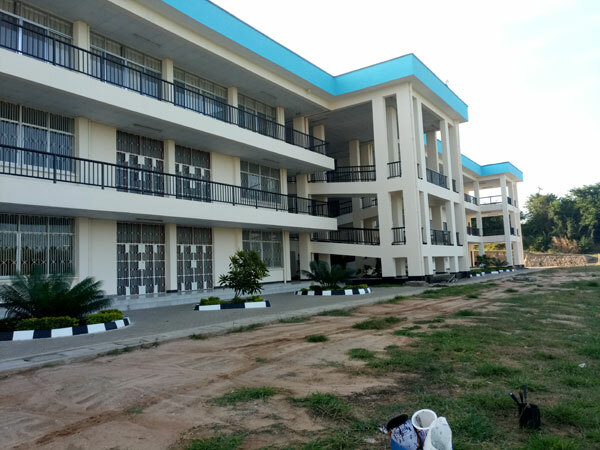 The University of Dar es Salaam, School of Education is among the four schools of the University of Dar es Salaam, others being the University of Dar es Salaam School of Law, the University of Dar es Salaam Business School and the School of Journalism and Mass Communication. The School is an exciting and a rewarding place to study. As part of one of the largest and most respected Universities in Tanzania, we lead the way in teaching and in conducting quality researches. At the School of Education we conduct outstanding research in education and related disciplines, and offer consultancy and outreach services. Here we gladly teach and learn. Welcome. One of our researchers presenting her findings. Research is one of the core functions of the University. Studying by doing. A nursery School Teacher enjoying learning with her Pupils in the classroom. A new building for our Mlimani Primary School which has all required facilities for learning. Empowering staff to be real enterpreneurs is one of the priorities of the school. The long-term vision of the School of Education is to become a national, regional and international centre of excellence for/in knowledge creation, skill development, training, value and attitudinal orientation in the development of individuals and groups as human resources as well as in promoting research and evaluation through using indigenous faculty as think-tanks in areas of education and teaching as a profession. Cooperation with other stakeholders inside and outside the country in efforts to improve the quality of education provision. The School’s institutional capacity improved. Opportunities for our graduates to study abroad. More than 3,000 foreign companies come to our University to look for graduates who are ready to work with their companies.